€50 off all Marc Jacobs glasses. While stocks last. Sunglasses not included. Free prescription sunglasses when you spend €149 on regular glasses!! When you purchase a Pepe Jeans frame! For a limited time, there is a massive 30% off all our Carolina Herrara frames! Free sports towel when you purchase sports glasses! Receive your free Elliott Optician's sports towel when you buy any sport's sunglasses in store. We offer a wide range of sunglasses for all types of sports. Pop in at your convenience and we can help you choose the perfect pair. Buy six months contact lenses and get one month free. No need to order the six months supply at once. With our new software we can track your orders and you will automatically receive one month lenses free when you have ordered six months supply. Offer includes all Johnson & Johnson, Bausch & Lomb and Sauflon lenses. Free goggles when you review us on Facebook! Get a free pair of prescription goggles when you review us on Facebook! Find us at www.facebook.com/ElliottOpticians. All spectacles included in this offer will be colour coded, you will get one pair for the above price and two pairs for the bottom price. Simply match the colour with the prices! Offer only on selected ranges. Buy one pair, get second pair for half price! 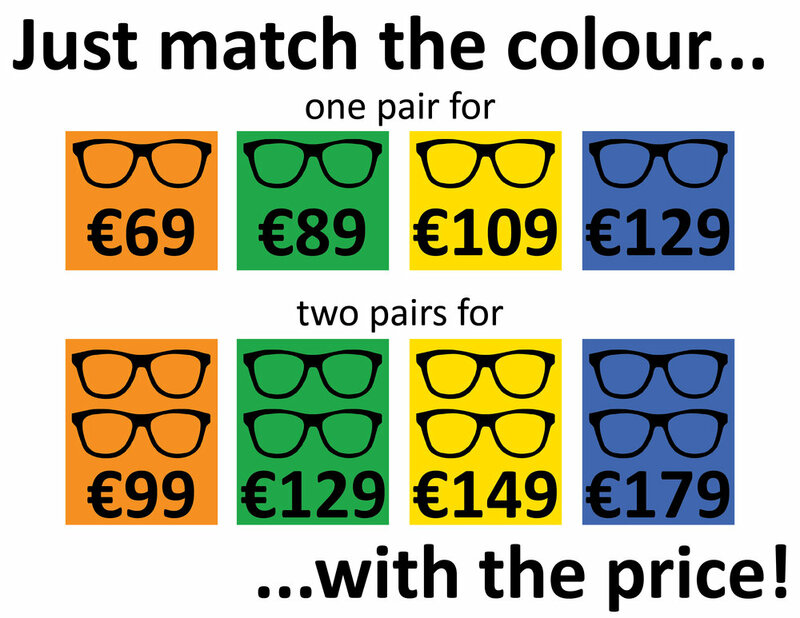 Buy a complete set of spectacles for €129 or over and get another full set at half price! Mix and match designer frames for all occasions. Call us today or drop in store for more details. Thinking of trying contact lenses, but not sure if they're for you? We offer a free trial of our ultra comfortable Acuvue Oasys contact lenses to help you decide. Just call us or drop in store!